Yikes, talk about being behind only in January. This bento is actually from January 11th! Anyway, it’s leftover pot roast. 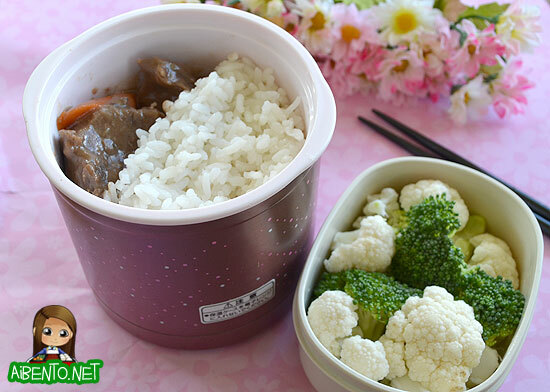 Not your most traditional bento fodder, but still a moneysaver since it uses leftovers. I used my Zojirushi Mini Bento and actually filled it up too high. When I put the cover on it started hissing at me and food started bubbling out. Instead of removing food, I just wrapped it up in furoshiki to keep it on, but it didn’t keep the food warm because of the opening. In the side dish I put raw veggies for me to eat with dressing at work. I’ve posted my weekly record for last week on Pikko’s House and I didn’t do so well on exercise, though I guess exercising 3 times is better than what I used to do, which was a big fat zero. As you can see, I didn’t eat very smart either, but I’ll hopefully get back on track this week.